The Portage Store offers a convenient canoe delivery service to the below mentioned major highway campgrounds. Reservations Recommended. Delivery, once per day to open campgrounds, based on reservations. 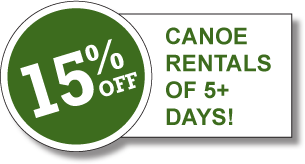 Rentals based on 24-hour day. Our Campground Delivery Service is FREE of all delivery fees for July and August. $10.00 flat delivery fee per rental party. Free delivery for rentals of three days or more.